Adding intensity will boost your results. What if you could exercise less and get better results? That’s the promise of interval training, which is defined as bursts of higher-intensity effort like jogging interspersed with active rest like walking. According to the American Council on Exercise, both your aerobic and anaerobic fitness will increase much more quickly when you make intervals a regular part of your workouts. Aerobic fitness is based on the body’s ability to use oxygen to burn carbohydrates for energy. When you maintain a steady pace while walking, running, bicycling, swimming -- basically, any type of cardiovascular exercise -- your aerobic fitness will improve. Although keeping a steady pace can boost your lung capacity and your body’s ability to deliver oxygen to the blood, interval training may be a more efficient way to increase your aerobic fitness. 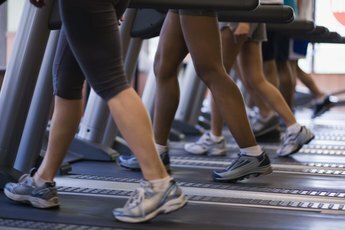 In a study published in the "Journal of Physiology" in 2006, researchers compared endurance training and interval training by having volunteers pedal a stationary bike. The endurance group pedaled at a steady pace for 90 to 120 minutes a session; the interval group sprinted for 30 seconds, pedaled at a recovery rate for four minutes and then repeated the interval four to six times. Although the interval group exercised an hour to an hour and a half less each day than the endurance group, they were much fitter. After two weeks of training, the interval group was able to pedal at a steady pace for twice as long as the endurance group. Anytime you sprint, lift weights, run upstairs or do any brief, demanding exercise, you’re drawing on your anaerobic fitness. Rather than using oxygen for energy, your anaerobic system burns sugars, called glycogen, which are readily available in your muscles. 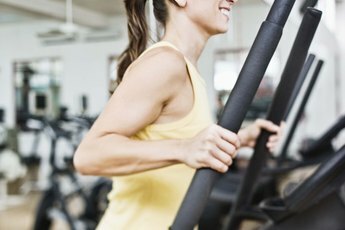 Typically, your muscles will tire quickly when you’re working out anaerobically, and you’ll soon feel the “burn” of lactic acid -- a byproduct of using glycogen. Sure, lifting heavy weights will increase your muscles’ ability to work anaerobically, but so will interval training -- and impressively so. According to the fitness doctors at MedicineNet.com, interval training will decrease the amount of time it takes your muscles to clear lactic acid and replace the sugars burned during intense efforts. Doing intervals will also encourage your body to store more glycogen. This means you’ll not only be able to work harder and longer, but you’ll recover faster from your workouts. Perhaps the biggest reward will be in calorie burn: A December 2012 report in the journal "Australian Family Physician" indicates that intervals are far more effective than steady-paced cardio exercise when it comes to increasing your calorie burn during and after exercise.